While admiring my beautiful aqua-garden today, I noticed this fleshy-looking thing under the driftwood. Upon closer inspection (no, this time I didn’t mince it up for fishfood), I realized it was a worm of some sort. Just as I was thinking what I could use to fish it out, one brave little White Cloud freed it (already dead by the way it was suspended), gnawed on the end of it, and deciding it wouldn’t make a very good lunch, left it to float to the surface. That’s when I snapped these shots. The worm was about 1″ long with a clearly segmented, flesh-colored body. Several weeks ago, I found a smaller (about 1 cm. 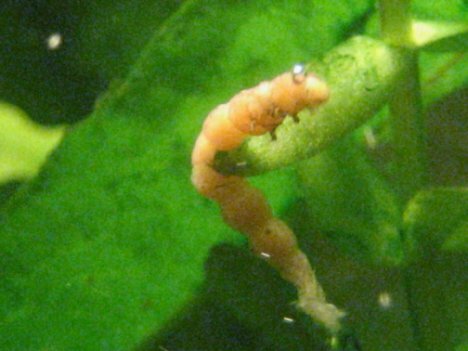 ), greener worm in my other tank. It looked like a small underwater inch worm. I can’t be sure that the worm I found today was living in the tank, as there was no prior evidence of him. But, the other worm’s existence was suspected because it was obvious that something had been eating the leaves of the sword plant he was eventually found in. 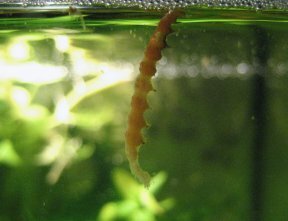 I’ve kept aquaria for many years and have never encountered worms like these, at least not that live under water. Of course, the two tanks that I currently maintain are the most, and only, successful planted tanks I’ve had. If worms of this sort are a common pest or parasite to the planted tank, this is the first I’ve heard of them. Anyone?